Another salad. I know. But after being on the road, it’s all I want to eat when I come home. Yesterday Clara and I headed out to the garden first thing to get inspired for lunch. The fridge was literally empty, save for a few dates, the usual condiment collection and other odd bits. After collecting the morning eggs, Clara busied herself with picking and eating peas; we’re getting a small second crop and she nabs every single pod. Nasturtiums, basil and tomatoes are going crazy in our raised beds right now; an obvious trio to harvest for my lunch and for this recipe. The #EatSeasonal bloggers and I are celebrating August produce today, so read on to discover our creations and my colourful salad. We started these edible flowers from seed and I’m always amazed at how well they do. Every so often I hack off a large section and drop it into the chicken coop. I’ve heard they are a natural dewormer and, anyway, the hens are crazy about them. I’ve had a minor letdown in my garden this year. Overall, the plants we started from seed back in March are thriving, but the two vegetables I picked up at a local nursery became overcome with bugs. Sadly, I had to pull the cucumber and zucchini plants and burn them. My beds are now bug-free, but we are down two varieties of produce. It’s frustrating, but I should have known better. Next year I’ll start everything from seed – or let the kids do it – and avoid the commercial seedlings. It’s tempting to take the shortcut, especially when the plants are already flowering, but — gross. Who cares about a jump start on the garden when it comes with unwanted ‘extras’? Not me. August has finally given us the correct number of sequential hot days to ripen my tomatoes and they are turning red like crazy. I’ve already professed my love of tomato salads this summer, and today’s version is a special edition only because: edible flowers! I harvested a few of my marigolds as well, and handful of geranium too, but those are for another salad, another day. It’s summer! Let’s eat all the flowers. If you’ve got nasturtiums in the garden, pick the bright green leaves and favour the smaller ones, as they will be more tender. A good wash is necessary to remove dirt and stray bugs. I’m making use of my newly thrifted and assembled outdoor vintage enamelware sink for this job. I’ve been wanting a sink on the back deck for some time for washing eggs, hands, and of course, garden produce. This summer it finally happened, and I’m rather tempted to post the tutorial, although we still need a proper faucet and drain. And even though I had a friend build the stand for me out of old barn wood. Really, all I’ve done is hunt down a speckled blue sink from the ’30’s, but I’m still taking credit for the project! 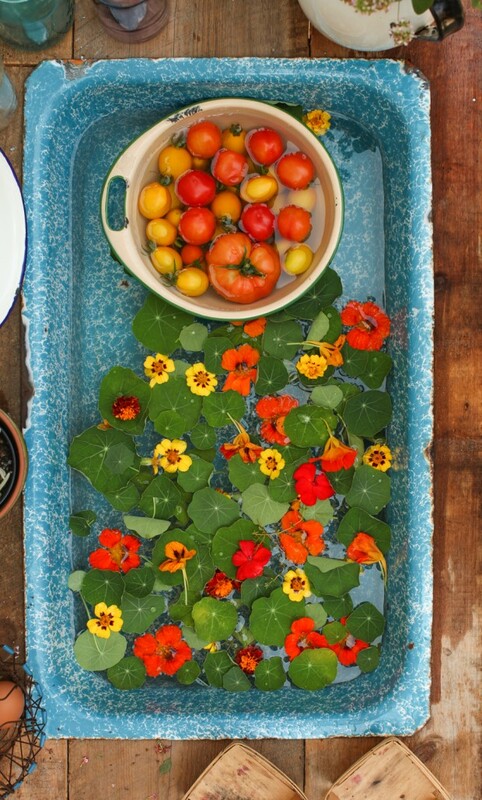 Nasturtiums, and all edible flowers, really, are pretty to eat but don’t come even close to filling you up. And when I’m buzzing around the homestead, I need a lunch to carry me through until afternoon tea. So along with loads of fresh-picked tomatoes, I rounded out the salad with slices of dates and a handful of pistachios. The sweet and salty additions paired well with the spicy nasturtium and added the contrasting textures the salad needed. Nasturtium leaves are quite peppery and best paired with a slightly sweet – yet light- vinaigrette. The flowers are very delicate and won’t hold up to a thick, gloopy dressing. I chose white balsamic vinegar, but champagne vinegar would also be fantastic. A splash of orange blossom water did wonders to perfume the salad and a sprinkling of sea salt finished it off. 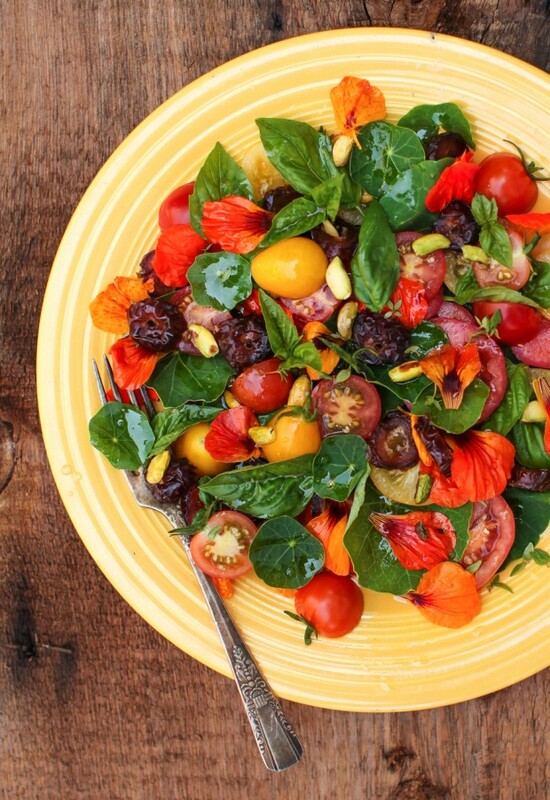 Fresh-picked tomatoes, slices of dates and a handful of pistachios. The sweet and salty additions pair well with the spicy nasturtium and add a contrasting textures to the salad. In a small bowl, whisk together vinegar, orange blossom water, a pinch of sea salt and the olive oil. Wash and dry nasturtiums, basil and tomatoes. Remove the stems from both the leaves and the flowers. Slice tomatoes into 1/4 inch rounds. Arrange on two plates with the greens and flowers. Slice dates and add to the top of the salad. Sprinkle with pistachios. Drizzle the vinaigrette over the two salads. Sprinkle with a little sea salt and serve at once. 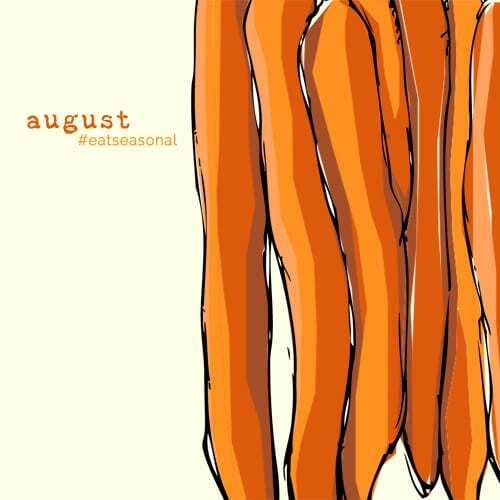 Find the full August produce guide on The Vintage Mixer. How do you feel about flowers in your salad? 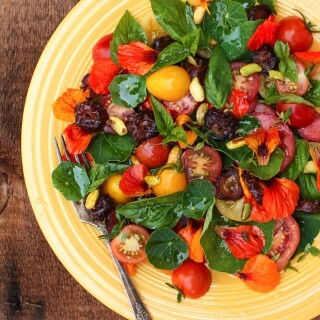 This salad is almost to pretty to eat! Love the addition of the pistachios and dates! oooh! i have never had a nasturtium before (and i just had to double and triple check that i spelled it right 🙂 but i’ve always been intrigued by the idea of eating flowers! this is such a pretty salad. and that sink!!!!!! i want one. Your garden is beautiful, Aimee! Totally jealous! And this salad looks incredible. The colors just scream summer! I totally agree about the seedlings. Mine are hardly growing this year, and are barely producing fruit. Next year we are starting from seed in the spring, no doubt about it! 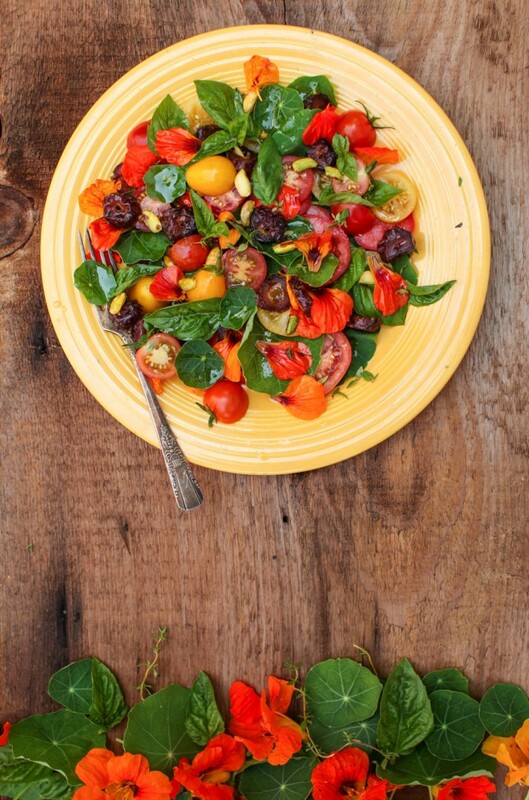 I am in love with your blue sink and this gorgeous salad! I have yet to put flowers in my salad but this makes me want to. So darn pretty. This is gorgeous! I know my girls will love eating flowers in a salad – can’t wait to serve this up! 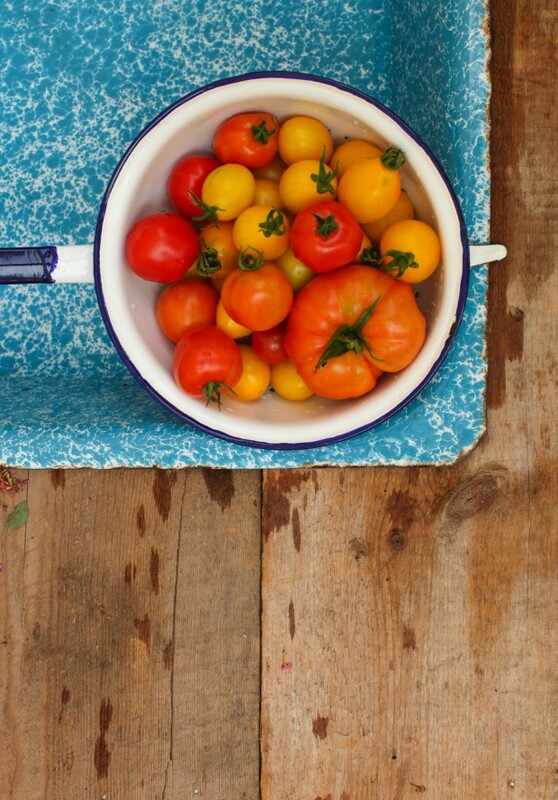 LOVE your vintage enamelware sink… of course!!! It’s amazing. And your salad is amazing too! Your sink is beautiful! What an awesome find. 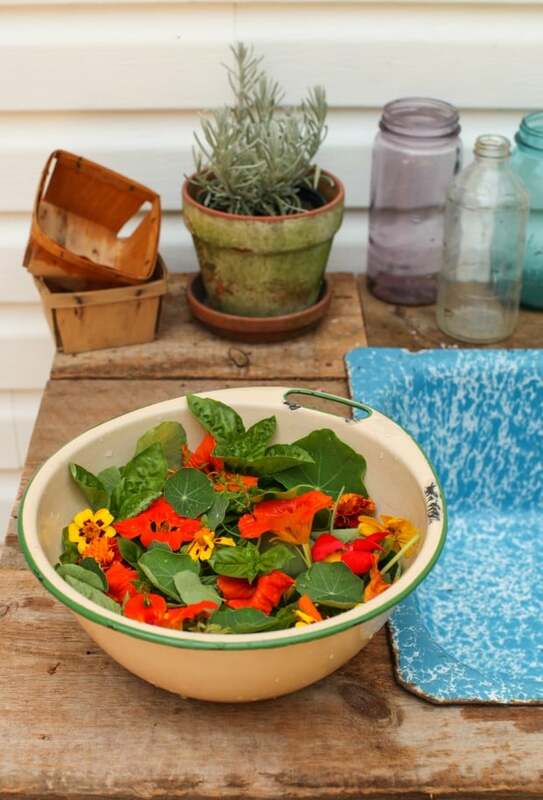 My son has been dying to try a salad with nasturtiums, so we’ll definitely be trying this–looks lovely! And, ‘yes please’ on the sink tutorial–I’d love to have something like this! Aimee, I totally agree with you about needing salad after being on the road. After a recent road trip I think I ate salad every day, sometimes twice a day, for a whole week! But more importantly I’m blown away by the beauty of your salad! I wish we’d grown nasturtiums, they add so much visual appeal to a salad. When we lived in Atlanta we couldn’t get them to grow so we hadn’t tried up here, but next year we’ll have to. Thanks for the inspiration. Your salad looks great! I wish I lived closer to you…I’d trade you some zucchini and cucumbers (of which we have plenty) for some of your tomatoes (mine aren’t quite ready). Enjoy August! Love the colours! I am going to have to try to track down some nasturtium leaves and flowers to try! This salad looks so fresh and full of healthy goodness!! Love the colors! This salad is gorgeous! And I love that sink. I absolutely love nasturtiums! and holy cow with those pictures!!!! Never occured to me to grow edible flowers. I need a list of what we can eat and what they taste like! Nasturtiums are peppery…got it. This salad looks amazing!! I love using flowers in food and drinks and this looks just perfect. Love your sink by the way as well! 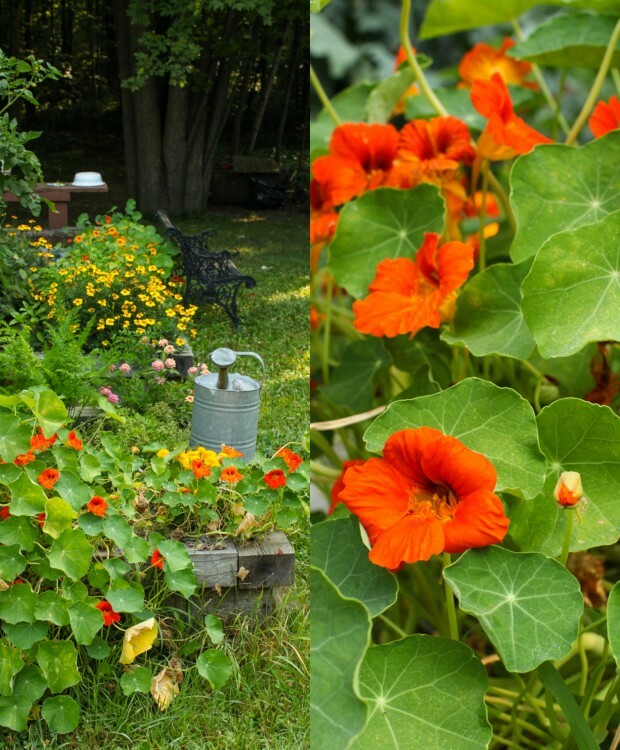 I love growing nasturtium in my yard because they’re easy to do from seed. Actually this year they grew back from last year. The only problem this year is that our drought here in California is not conducive to growing much 🙁 My nasturtiums are not looking too pretty right about now. I’m working on a mid-season garden rehab by tearing out other unsuccessful plants and diverting that water to anything else that could possibly still survive. I had no idea you could eat the leaves of nasturtium! Love it!